Liberia and Sierra Leone represent the corner of Africa where tropical rains are abundant. In tropical West Africa, the most rainy season starts in April and ends in November, but this year it began much earlier ...At Tappita - where the Salesians have recently reactivated a mission - people live on agriculture and the rhythm of the seasons and the rainfall decide on the harvest's quality and quantity. 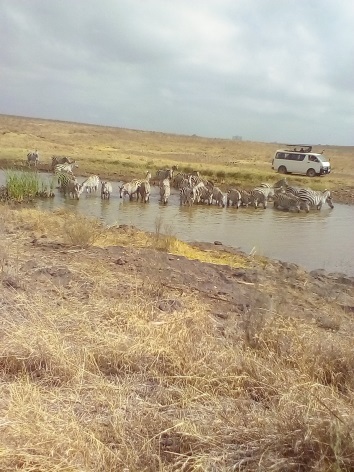 The rains also bring less pleasant side effects, especially in the field of health, housing and transport. In some moments one has the impression that life stops ... but no! 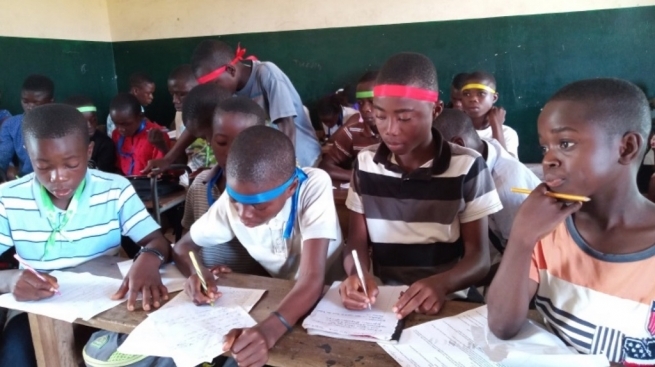 Life goes on, the struggle gets harder, but one doesn't give up.In Italy there is the "Estate Ragazzi"; in Liberia and Sierra Leone, the "Holiday Camp" is organized for the young. The substance remains the same: with schools closed in July and August, the children have more free time and the camp and its educational tasks keep them away from idleness and from the street.In truth, the children are never idle in Tappita: even during the school year, as soon as school ends or on Saturdays, the children follow their parents into the countryside, walk around the streets selling bags of water, candies, biscuits ... In this way they help to put food on the table – and into their bellies - before going to sleep.The Salesians on site alternated to illustrate various aspects of the training course for animators, adding the ingredients necessary to make it meaningful: full-time, from 9.00 to 17.00, including school lunch; school lessons in the most relevant subjects; learning the rudiments of several practical activities, such as computers, drawing, music, dance, baking and preparing desserts, tailoring and sewing; socializing activities: communal games, quiz competitions, dance competitions and drama performances according to the various cultural groups. All activities are framed in a point-scoring scheme for the four teams in which the participants were divided. At the end of the "Holiday Camp", there are prizes for everyone.The conclusion is unanimous: "A unique experience! Too bad it did not last long! It should last for the whole two months of the holidays! "As far as the community life of the Salesians is concerned, the "English-speaking West Africa" Province (AFW) organizes Spiritual Exercises, an opportunity to stop for a moment, pray, reflect and check if things are in order. They characterize moments of fraternity that also cancel the physical distance and the sense of isolation. Thanks to the generosity of many benefactors, the Salesians in Liberia can now equip a new scientific laboratory and expand the academic courses and fields being offered, so as to welcome new students into the "Mary Help of Christians" school in the Matadi district of Monrovia, capital of Liberia. In this way the center managed by the Salesians can continue to extend the structures and services offered to the needy population.The "Mary Help of Christians" school started operating in 1993 and currently hosts almost 600 students, from children to secondary school students. It provides education and support for children and adolescents who otherwise would have very few opportunities to improve their lives. 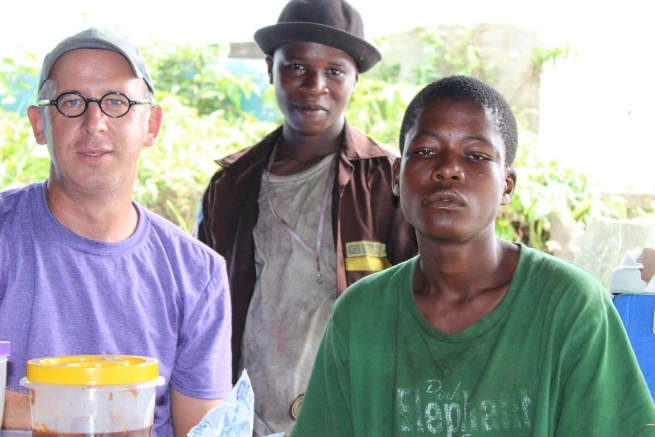 At the school the Salesians have also developed a food program that guarantees a nutritious meal a day to over 100 students.The country is still in the phase of recovery from the Ebola epidemic that between 2014 and 2016 struck circa 11,000 people and left over 4,800 dead. Liberia has been the country where the disease has manifested itself in the most lethal form, why the Salesians dedicate themselves with great effort to the children left orphans: to provide them with ongoing care and to ensure that they also do not lose educational opportunities.Other Salesian programs launched in recent years provide food, health care and education to children with the ultimate goal of reintegrating them into their families.The Ebola disease, which arrived when the country was trying to recover from two consecutive civil wars being waged since 2003, plunged the country into a serious economic and social crisis, which brought it back to levels of extreme poverty.With a population of less than 5 million inhabitants, 64% of Liberians currently live below the poverty line and 1.3 million of them live in extreme poverty. For this reason, Salesian programs in Liberia offer young people the opportunity to reach their potential through educational and social projects. 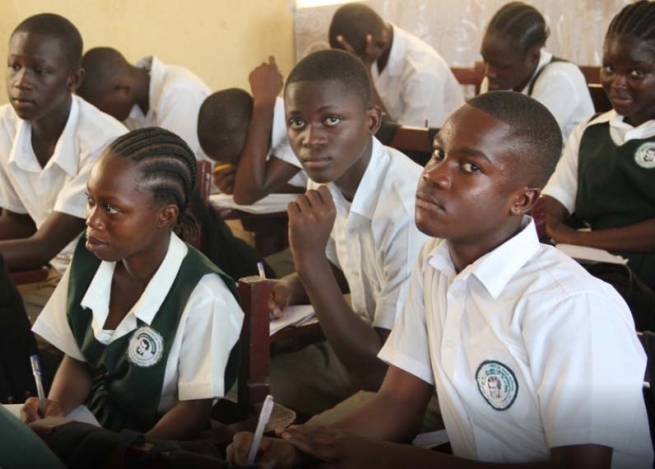 In recent years, accompanied by Salesian volunteers and Catholic schools, the spiritual Sons of Don Bosco have been able to help over 2,300 students with their families.In addition to the "Mary Help of Christians" school, the "Don Bosco" Youth Center is also active in Monrovia, which supports young people with extracurricular and leisure activities. Young people can participate daily in recreational and sports activities and attend workshops of singing, dance, theater, circus ...They can also complete their formation through the vocational training courses, among which there are specific fields for girls and women, so that they can become self-sufficient and be entrepreneurs. 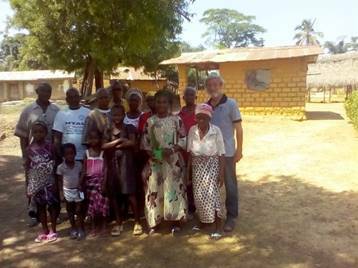 21 December 2017 (ANS – Monrovia) – Brother Lothar Wagner SDB has been in Liberia for about a year now. In the West African country the 43 year-old Salesian takes care of children and young people who are socially marginalized, such as the homeless “cemetery children” from Monrovia. The young people have to sleep in tombs because they do not have an alternative sleeping place.by Kirsten PrestinHow are young people doing in Monrovia?The young people suffer the most from the consequences of a decades-long rebel war and the Ebola crisis. The educational system is rated one of the worst in the world. The police and judiciary are corrupt. The health care system has broken down. According to a new study more than half of the population is directly affected by famine. I could continue with that list. Ultimately it is fatal that the state crisis has reached the families and thus also the children. Despite hard work, the daily salary does not suffice to feed the family. Frustration and the resulting aggressions of the leaders in the family are transferred to the children. Families are torn apart, whole rows of children end up on the streets. In the last couple of months I have met numerous children who consume drugs to escape their everyday life. That is simply terrifying.What do youths need the most?The young people need encounters with people who take their problems seriously, who help them face conflicts in a constructive way. Youths need role models – people who show them a hopeful perspective in life. And they need a lot of attention. Attention they do not receive in most cases and then they can easily end up in a vicious circle of drug addiction, prostitution, acquisitive crimes and finally sickness and despair.The children and also the Salesians at the grassroots level need a lobby. They are in need of people who support them. Everybody should act firmly so that children in seemingly hopeless life situations get professional and motivated people to support them. Often the children need a doctor, a teacher, an educator, even more a friend as their companion. But these people also need to be trained. Besides personnel also rooms are required, in which the children can develop themselves. A school is needed, a training place and a playground as well. We should also not forget that many children who are in danger are in need of temporary shelters.How can the Salesians help them?Firstly, we have to be present. Or in the words of Francis, the Pope: we have to be present in the peripheries. A sustainable partnership between the children and the Salesians is very important. A non-binding declaration of intent, as we often see it in politics, is not sufficient in this case. Instead the declaration must be written in a concrete and unmistakable manner to make sure that we go through thick and thin with them, day and night: we take them from the street and bring them back to their families, take them from prison back to school, from drug addiction to a meaningful life. They need intact families, good education and a viable professional training.How is the current political situation in Liberia?At present, this is difficult to assess. It seems that a few influential people consciously make the situation complex. Currently it is hard to see through the situation. The international media with their short tickers rarely report about the situation in Liberia because the political situation is simply too diffuse. Fact however is: the people want a political change. (…) The presidential elections were interrupted after the first round in early October due to the accusation of massive electoral fraud. (…) The Supreme Court and the National Election Commission will decide if a run-off election between the two candidates will be held but they take an extraordinary long time to make a decision. It is unclear what the role of both institutions actually is. We sincerely hope that the Liberian people show perseverance and patience.Which moments or encounters give you strength?It was pouring rain when I came to the central cemetery in Monrovia for the first time. There I found children who lived in tombs because they did not have a roof over their heads. Suddenly, I had longer eye contact with one of the children who was looking over at me from a tomb. After a while the boy smiled at me. Without any words. A small gesture as a clear sign, ann invitation to his world. It was simply overwhelming. He allowed me to come closer, to enter into his world. This really reinforced my decision to be there for the forgotten children. What a message was given to me through the child, when I saw in him Christ himself. I met him through the child, in the tomb. An incredible feeling of happiness. A gift of grace in the middle of unthinkable suffering. 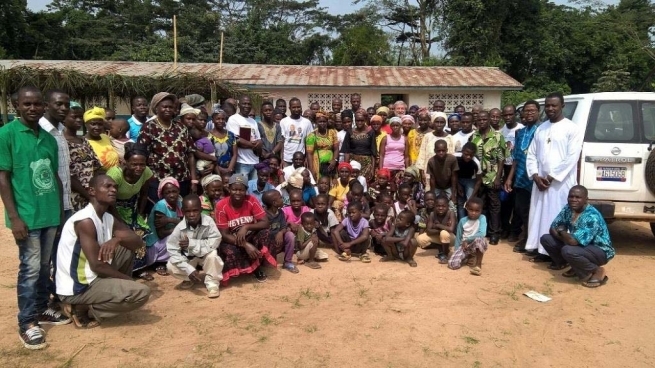 The Salesian mission at Tappita, in the Liberian forest, is now re-establishing itself again after years of forced expulsion: it was founded by the Salesians before the civil war in Liberia (1989-1997), but was then handed over to the local clergy for the impossibility of communications and lack of personnel. In this phase of re-awakening, it needs everything: from small things, like a whistle to referee the games of the oratory or the catechetical animation material, to the most demanding, such as reactivating the school, creating the youth center ... It is a reality where the pioneering spirit of the mission ferments every activity of education, social development and evangelization.The three Salesians who have taken over the mission have given themselves a few months to take stock of the situation, understand the challenges and draft an action plan. They currently live in the house that belonged to the Consolata Sisters until they too had to leave due to the war. In the last 20 years the structure has been used in part by the priest who visited the mission from time to time and then permanently, but its deterioration was progressive and fast. For Christmas activities, the community had decided to adopt the "do as it has always been done" method to see and learn from the situation. And despite the challenges of the reality of Tappita – rationed electricity and water supply, sketchy communication routes, linguistic difficulties with the local population - the religious have begun to shape pastoral activities.In January, all the parish groups met: Pastoral Council, Economic Commission, Men, Women, Young People, altar boys, Chorus, and various Associations ... "Every evening, from 5 pm onwards, we 'listened'," explained Fr Riccardo Castellino, SDB.The parish also has 24 mission stations in the villages. The Salesians have decided to visit them all: so every Sunday one of them stays in the parish and the other two reach two neighboring villages.The local people are simple, poor. They live on agriculture, and though they do not lack food, they have no money to spend. 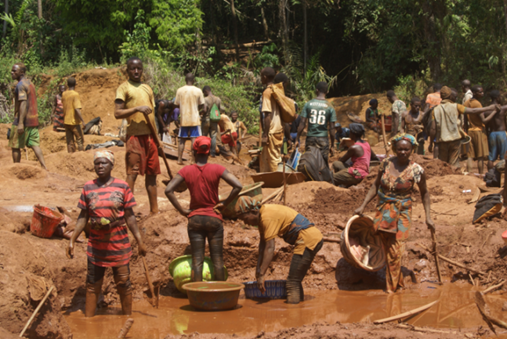 All the communities, with the little they have, have built or are building a little church of mud and sheet metal. "There is a lot of work to do and this involves a great deal of energy and material resources. But they too are children of God and deserve our full attention!," concludes Fr Castellino. 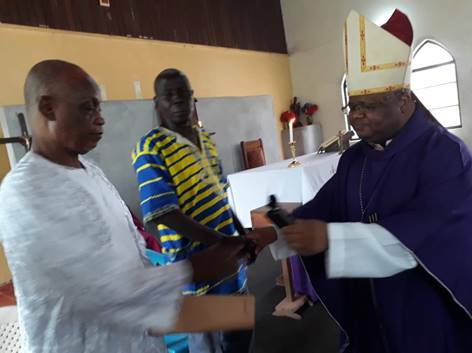 The Salesian mission in the Liberian forest, at Tappita, continues its development, expands its services to the local population and gives new impetus to apostolic activities. But the community, not ready to settle down, wants to do even more and is already looking at all the other initiatives to carry out.At the end of March, electricity was also brought to the mission which, until now, was the only residence in the entire town not connected to the grid. "Now the church, the school and the dispensary can also connect and carry out their activities more efficiently," said Fr Riccardo Castellino, SDB, in a letter.Among the items in the to-do list are the mission's roofs. The community hoped to be able to deal with this issue later, but the unexpected increase in seasonal rains made the change mandatory.A new area of commitment will be the construction of a palava hut, that is an outdoor kiosk where meetings, reunions and activities can be organized and hosted. "The parish lacks rooms for meetings and for catechism. This is a first, quick and easy solution," said the Salesian. Subsequently the intention is to restructure the old Salesian residence, which was sacked during the war.And again, "always thanks to Providence," as the missionary points out, two motorcycles have arrived, which will allow them to reach the villages cars cannot access and make travel easier and cheaper.Each new instrument is aimed at evangelization and education: the Salesians continue to visit the surrounding villages, have imparted the Sacraments of Christian Initiation to various catechumens, have held two meetings in as many villages. "The methods are the usual ones," the letter continues. "Three days in a village, where people sleep in the school or in the homes of families who welcome them. A roof of branches is prepared, one cooks outdoors and does catechesis. We discuss the problems of the various communities, make plans for the year and encourage each other to maintain and live the faith. "The mission also welcomed the local bishop and the Superior of the Salesian Province during two quick visits. "After seeing us with his own eyes, the Provincial assured us that this is a very significant and meaningful presence. This motivates and urges us to do more and better. Now let's look forward. We are thinking about the Youth Summer Camp. It will be an absolute novelty," ends Fr Castellino's letter. This time I write to you from Sunyani in Ghana, where I arrived on August 14th. Today, September 8th is the day of the birthday of Our Lady, today is also the day when, in many places the salesian novices have the first religious profession. 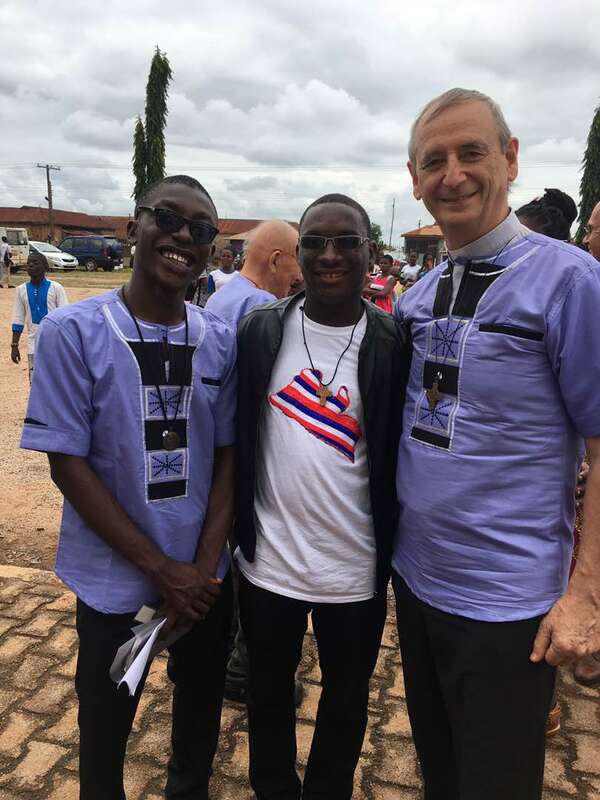 Our Salesian Provincial AFW also presented 13 young people who made the vows of poverty, chastity and obedience to serve the poor and the young in need, like Don Bosco Among them was also a Liberian youth Androvish Berrian. Yesterday, another young Liberian Edward Boateng started, the novitiate year. Both of them: Androvish and Edward, have made their period of aspirantate in Matadi in the past years. The goal of the mission is not only to get closer to those who are more in need but also to discern and accompany vocations to priestly and religious life. The testimony of these young people who with generosity respond to their vocation is a sign that the Lord does not leave his flock without shepherds and without prophets.